We are honored to feature Christina Maria Gadar. Christina is the owner of Gadar Pilates. The studio is located in beautiful Sarasota, Florida. Christina is a dual citizen of Brazil and the United States. She grew up in Massachusetts and currently lives in Florida. At the age of seven she started rhythmic gymnastics with a Romanian teacher named Rene Saunders. The gymnasium was in the same building as her afterschool care and she begged her mother to let her do it. At the age of nine she went to a proper ballet school and never looked back. Her passion was ballet from the start. Although she had very good flexibility and stage presence, she always struggled with strengthening her feet. Over the course of her dance training and career she broke her feet five times! 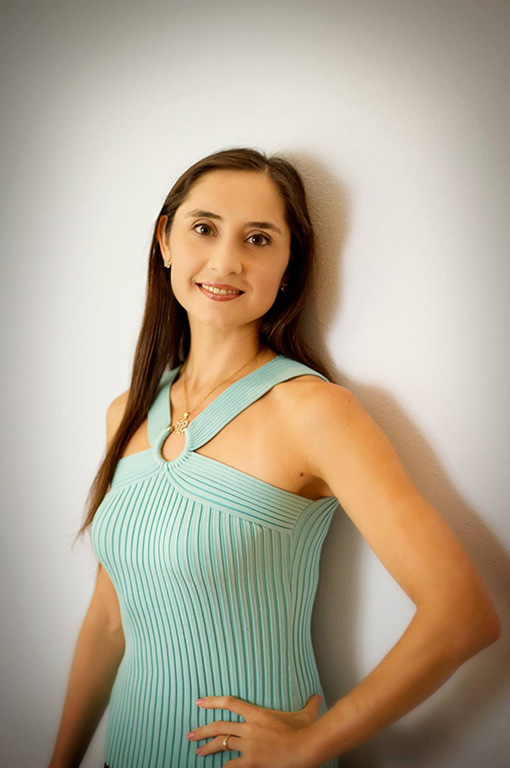 After dancing for John McFall at BalletMet and the Columbia City Ballet, she moved to Sarasota, Florida in 1996 to dance with the Sarasota Ballet of Florida. Her husband is from Moscow, Russia. He used to dance with the Bolshoi Ballet, and they met while dancing together at the Sarasota Ballet of Florida. Christina had a strict rule of not dating coworkers, but she broke that rule during her last season dancing with the company. Her husband is now an acupuncture physician and they have two amazing, kind, and talented children along with many furry family members. Have you studied any other forms of corrective exercise? If so, how was it compared to Pilates? When I was a young teenager, my amazing mother used to drive eight hours from Massachusetts to New York City and back (in the same day) every Saturday for me to take private ballet lessons from some of the most talented ballet teachers in the world (David Howard, Floris Alexander, Michael Maule, and Valerie Taylor). On the advice of my local ballet teacher at the time (Jacqueline Cronsberg), each ballet lesson in New York was followed by a private lesson with Hilary Cartwright at White Cloud Studio. I didn’t know the name of the method I was doing, I just knew I had the best teacher at White Cloud. Now this method has a name and it is Gyrotonics. This was well before creator Julio Horvath named the system Gyrotonics, before he modified his equipment to be elevated off the ground and before Gyrokinesis was a part of the method. Although I took Gyrotonics regularly, it feels like another lifetime ago. Here is what I remember of my time at White Cloud: I remember the feeling of muscle soreness in all the right places after each lesson. I remember moving my limbs well outside my frame for many of the exercises. I remember the old-fashioned vibrational belt machine I used before the lessons to get my blood circulating. I remember New York City ballerina walking across the studio as she repeated: “I feel it. I feel it.” I also remember doing a backbend inside the padded rungs of a ladder, which I now realize was a movement inspired by the Pilates backbend on the Ladder Barrel. I consider myself fortunate for having had the opportunity to study with Hilary. My only regret is that I didn’t know about Romana during that phase in my life when I was in New York City every week. I tried Gyrotonics many years later after becoming a Pilates teacher and I did not enjoy it, but I attribute that to the teacher. What I remember most from that lesson is that the teacher’s name was also Christina and she said my stomach was the size of Switzerland. Is that good or bad? It is after all one of the smaller countries in the world… My teacher Romana used to say that what ever you do should be done well. She didn’t put Pilates above other forms of exercise. She simply reminded us that if you were going to do something that it should be done right. That saying, “If you’re going to do it, do it right” ended up being my tagline. Here is my comparison of Pilates and Gyrotonics:Pilates works within the frame of the body, Gyrotonics works outside the frame of the body. Pilates is linear in movement, Gyrotonics is circular in movement. Pilates uses springs for resistance, Gyrotonics uses weights for resistance. Pilates is not a regulated field, Gyrotonics is a regulated field, but Gyrotonics teachers can start teaching the basic systems before having been trained in the intermediate and advanced systems. Like yoga, I think Gyrotonics is a nice complement to Pilates training. I cherish the time I spent at White Cloud but personally don’t feel the need to teach it because I feel Pilates addresses all of my clients’ needs safely and effectively. I discovered Pilates in 1989 while a student at the Boston Ballet School. Barbara Harris was hired to begin a Pilates program for dancers. The top floor of the building had the Pilates apparatus, but my class was only on the mat and it followed my ballet class once a week. I am ashamed to admit that I cut my Pilates classes often. The equivalent of a ballet nerd is called a “bunhead” and that is what I was at the time. I didn’t see the value of Pilates and often snuck into an empty studio to practice my pointe work instead of taking my Pilates class. Fortunately for me, I didn’t always find an empty studio so I took enough Pilates classes to learn the mat routine by heart. Years later as a professional dancer, I discovered the value of Pilates when I was injured. I turned to Pilates in desperation to keep my form while I was unable to dance. Where did you receive your Pilates education and who were your teachers? I learned Pilates on the apparatus when I came to Sarasota. After painful Achilles tendonitis brought my dancing career to a halt, I turned to Pilates. Romana Kryzanowska and Sean Gallagher had just opened up a certification studio an hour and a half away from Sarasota. In the summer of 2000 I completed the 12 day intensive seminar (the last one offered outside of New York City) with Roxane Richards Huang. I feel lucky to have experienced the intensive introduction into the apprenticeship because it was very thorough. When the apprenticeship is split into different levels taught by different teachers it is easy for some of the exercises in the repertoire to get overlooked. When I was a dance student I was always looking ahead, wondering where I would end up dancing professionally. I decided to approach my Pilates apprenticeship differently. I cherished each moment and although I needed to start working again, I made sure that I took everything in and focused on the present. I drove back and forth from Sarasota to Fort Myers every day for five months. I lived in the studio. Master teachers handpicked by Romana came to the studio all the time. I took private lessons from every visiting master teacher. My first exam was with grandmaster teacher Juanita Lopez. My intermediate exam was with grandmaster Sari Santo. Finally I felt ready to meet Romana in New York City. While there I lived with her grand daughter Daria. Certifying studios outside New York City were still in the beginning stages and Romana was not pleased when she heard I was already in my final stage of apprenticeship and was just now meeting her. I took as many private lessons as I could with her at Drago’s Gym and I observed her teach all of her lessons. She gave me her fussiest clients and I didn’t get frazzled once. I had earned Romana’s respect and I look back at that time as one of the best times of my life. Romana nicknamed me the “Amazon” because of my strength and my Brazilian background. She gave me my final exam personally and it was bittersweet for me because that meant that I had to leave because I needed to start my new career. I made it a priority to continue private lessons with her when she came to Florida and I took private lessons from her when she first moved to Texas. She helped me find my new passion and I am forever grateful. Who is your Pilates example (besides Joseph and Clara of course…)? What makes him or her special? She made me feel like a family member. She and my Brazilian grandmother were very similar. They both enjoyed traveling, champagne, flirting with nice looking men and they both had a passion (my grandmother’s passion was writing). Romana is still with me in the studio for every lesson. I use her cues, her spots, and tell her stories to all of my students. I miss her and hope she is proud of me. What person outside of the Pilates world has influenced you the most as a Pilates teacher? Premier danseur Fernando Bujones shaped the way I teach. He had always been my idol and when he became a permanent guest artist with the Boston Ballet Company I thought I had died and gone to heaven. The first performance I saw him perform live was Giselle. I waited eagerly outside the backstage door after all of his performances no matter the weather (I remember one particularly cold and snowy evening), only to be tongue tied by the time he finally came out. He had been married to Marcia Kubitschek, the daughter of the former president of Brazil so he and my mom spoke in Portuguese while I looked on in awe. I asked him to sign his books and photos for me, and that is about all I could muster. After stalking… uhh, I mean following his career closely, he agreed to be my private coach (no more long drives to New York for my mom!). Fernando was meticulous in the way he taught. Every movement he taught had to mean something, nothing was thrown away. He encouraged me to strive for excellence and to live my life with integrity, sincerity and class. When I was preparing for a ballet exam at the Boston Ballet school he polished every part of my exam repertoire and then gave me his own exam. He gave me a graded paper after my exam with him that was worth more than the school exam ever would be. More than a coach, he became a family friend. My grandmother invited him to our home for a home-cooked Brazilian dinner. With all of his traveling he had a solitary life for a while and he said he considered us among his closest friends. When his daughter came to visit from Brazil my younger sister loaned her dollhouse. I distinctly remember him encouraging his little daughter to be more creative in the way she arranged the furniture in the dollhouse. He sought to make everyone reach their full potential of creativity. The highlight of my time with Fernando was when he choreographed “Raio de Luz” for me, a solo set to the music of Clair de Lune. I had always been a meticulous note taker. I wrote notes after every private ballet lesson I have ever had and have done the same with every private Pilates lesson I have had. I often look back at my notes from my teachers, most especially my lessons with Fernando and Romana. I keep both of their photos in my studio. What Pilates apparatus is your favorite and why? Do you prefer a certain brand? I am partial to Gratz Pilates apparatus. I have worked and taught on other brands of apparatus and really notice difference. The size of the Gratz equipment, the height of the reformer foot bar, the shape of the reformer shoulder blocks all keep the work in the powerhouse and not in the limbs. The springs are strong, but not tight so the practitioner does the work, not the springs. I saved up for each Pilates apparatus one at a time and I love the quality and purity of design of the Gratz line. My job as a Pilates teacher is more than just teaching exercises, it is to inspire my students, but I also feed off of their motivation to learn. I like hard workers that are interested in more than how Pilates will make them look in a special outfit. I enjoy working with clients that appreciate the mind-body connection necessary to perform Pilates well. I thoroughly enjoy working with professional athletes and artists. I enjoy working with young children and older adults. I enjoy working with business people that have paved their own way. I am inspired by students that do Pilates to deal with the effects of medical conditions like multiple sclerosis, fibromyalgia and cancer. Overall, I enjoy having clients that appreciate the value of their Pilates training and see the difference it makes in their lives. What is the most memorable thing that has happened during one of your Pilates lessons? One of the funniest things one of my clients told me was her excuse for forgetting an exercise. She told me: “I’m sorry. I have murder on my mind!” She happens to be a writer and was working on a book series of historical fiction at the time. I teach seven to eight private lessons a day, five days a week during school hours. My lessons are exactly 50 minutes long and I take a 30 minute break after the first four or five lessons of the day. I record each student’s lesson and make sure that it is structured in three parts: reformer and/or mat, accessories, and an ending that incorporates breathing, and/or inversion, and/or spinal articulation. I teach semi-privates as well even though I have only one of every piece of equipment. To teach semi-privates in my studio I insist that my students know their workout routine well and be self-efficient with the equipment. They need not be the same level, they just need to know what they are doing. I spot one student on one apparatus while cuing another student on another apparatus. Teaching semi-privates keeps me on my toes. The first couple of semi-privates I taught gave me migraines, but now I have a good formula. Do you believe in teaching a blend of Pilates styles or not? When I was a dance student I was exposed to the most talented ballet teachers from all different styles. I studied with Madame Tatiana Legat (Kirov training from Russia), Li-Chou Cheng (of China), Jacqueline Cronsberg, Sandra Jennings, and Suki Schrorer (Balanchine style from USA), Mary Tolland (Royal Academy of Dance training), and Fernando Bujones (Cuban-American). I am grateful for the variety of approaches to ballet I was exposed to, but it also made it confusing. Each style has its own approach to doing a pirouette etc. I recognize that there are many fantastic Pilates teachers that come from different training centers around the world, but I like keeping my teaching style loyal to one style, the method taught to me by Romana. I only take Pilates lessons from Romana’s hand picked master teachers and when there are discrepancies I mark them in my notes. I sometimes get clients who come from teachers with a different Pilates methodology and I just ask my new student to be open to my teaching style. If they want to do an exercise that I was not taught to teach (like Eve’s lunge on the reformer), I simply find them another exercise that I was trained to teach as a substitute (like the runner’s stretch on the rungs of the ladder barrel). Yes. I started filming the Pilates workouts on the different pieces of Pilates apparatus after witnessing a “Pilates” reformer demonstration at a Health Fair on Main Street in downtown Sarasota. The teacher had her hair pulled into a lopsided ponytail and sat in one of her hips as she shouted into a hands-free microphone. The exercises didn’t resemble anything that I knew as Pilates. I looked at my husband and said that I was not going to complain about what I had just seen, but instead I would take my reformer to the same Health Fair six months from then and demonstrate what Pilates really is. My videos were designed to educate people about Pilates. It is hard to pick a favorite video as each one is different. The reformer video was challenging because there were a lot of distractions from people walking by on the street, it was also beautiful to perform my workout under the beautiful canopy of the oak trees. The mat video was shot on the beach and the saltwater went into my eyes and at the end of the routine I slipped on the wet mat when I tried to stand up from the seal and had to perform the whole thing all over again before the sun set. The wunda chair video was performed at my local park after it had rained. It was challenging to perform the routine on the moist, uneven ground. My book trailer was different from my other videos because it was edited. I had a lot of fun matching the exercises to the music. If I absolutely had to pick a favorite, I think it would be my cadillac video because it was so challenging to perform the routine non-stop with flow. I had a lot of false starts with the cadillac video. By the end of filming my stomach was cramping from having worked so hard. Can you tell us something about the Pilates book you have written? My book is actually a workbook called “Pilates An Interactive Workbook; If You’re Going To Do It, Do It Right.” (I would love to have you review it!) It was designed to encourage Pilates students to become more self-efficient. It is also a fantastic reference for Pilates apprentices. It covers the basic and intermediate mat, the mat performed with the magic circle, the weights series, the additional magic circle exercises, the ending wall series and the basic and intermediate reformer. Basically, it covers the most common exercises done in the Romana’s Pilates Method. The information covered in it is timeless. It was published the day before Romana passed away, but her grand daughter has given it the seal of approval saying that it is beautiful, simple and pure and her grandma would have approved of it! Are you planning to write more books? I vowed that I would never write another book after my first book. Working full time and being a mother is not conducive to writing a book! I felt more pressure writing a book than I ever did preparing for a ballet performance. I realize now that the difference is that ballet is an ephemeral art. No ballet video can duplicate a live performance. A book however is there forever. I had to make sure that I would still be proud of it years after its publication. That being said, I have decided to overwhelm myself again by writing another book. This Pilates book will focus on Pilates for young children both with and without the apparatus. It is a Pilates subject that is unprecedented. I was inspired by my work with a seven year old with leukemia and I was faced with the dilemma of providing him the support from the apparatus with the correct modifications to keep him safe. I have been working with young children between the ages of 6 and 11, with varying levels of body awareness and concentration. It is uncharted territory and very different from my last book. Because of the subject matter it will be far more detailed and filled with tips on child friendly cues and each exercise will have a few variations to choose from. Will you keep on practicing and teaching Pilates? What is your Pilates dream and your goal in life?